Dr.Edward Clemons, Jr. was born in Atlanta, Georgia. He later moved to Durham, North Carolina, where he graduated from Hillside High School. He received his Bachelor of Science degree from Morehouse College in Atlanta, GA and his Doctor of Dental Surgery degree from Howard University School of Dentistry. 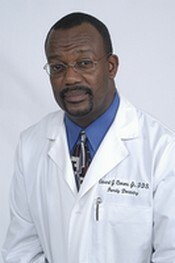 Dr. Clemons graduated with honors from all three programs and was president of his dental class at Howard University. He completed his dental residency at St. Elizabeth’s Hospital in Washington, DC. In November 2010, Dr. Clemons completed 216 hours of continued education in a nine-month implant continuum taught by the Triangle Dental Institute in Research Triangle Park, NC earning a Fellowship Award from the International Congress of Oral Implantologists (ICOI). His training included lectures, workshops and one-on one mentoring on implant surgical placement and restoration, associated bone preservation and ridge augmentation grafting and connective tissue grafting. Most recently, Dr. Clemons was elected to the North Carolina State Board of Dental Examiners for a 3-year term, beginning August 1, 2018. The North Carolina State Board of Dental Examiners was created as the agency of the State for the regulation of the practice of dentistry in this State. Members of the Board licensed to practice dentistry in North Carolina are voted upon and elected by their peers, which consists of every person licensed to practice dentistry in North Carolina and residing or practicing dentistry in North Carolina. The Board of Dental Examiners consist of six dentists who are licensed to practice dentistry in North Carolina, one dental hygienist who is licensed to practice dental hygiene in North Carolina and one person who shall be a citizen and resident of North Carolina and who shall be licensed to practice neither dentistry nor dental hygiene. Congratulations, Dr. Clemons!! Dr. Clemons has been in private practice since 1988. He is an active member of the American Dental Association, National Dental Association, Academy of Computerized Dentistry and the North Carolina Dental Society, as well as, The Old North State Dental Society, The Community Health Coalition and The Durham Academy of Medicine, Dentistry and Pharmacy. His belief is that the best patient is an educated patient and for that reason, he has invested in a patient education system for his practice. Clemons Cosmetic and Family Dentistry is equipped with the latest hi-tech dental equipment. Dr. Clemons continues to implement leading edge technology in the transformation of smiles. His goal is to provide the best dental care possible. Spare time for Dr. Clemons is spent with his family, enjoying a myriad of activities including golfing, scuba diving and traveling both nationally and internationally. He also enjoys jazz music and photography. Ed is a member of Alpha Phi Alpha fraternity and a deacon at his Church. He is married to Yolanda and they have three children, Lyndsay, Edward, III and Vivica. His cosmetic and family dentistry office is located in the Southpark at 54 Professional Center, off of Highway 54 West, in Durham. Please visit us at 5011 Southpark Drive, Suite 110, Durham, NC 27713. Our telephone number is (919) 361-9700. Our fax number is (919) 361-9747. Clemons Cosmetic and Family Dentistry offers everything you need for an attractive and healthy smile!